In this article, we will continue telling you about other Russian habits which surprise foreigners who arrive in Russia for the first time. 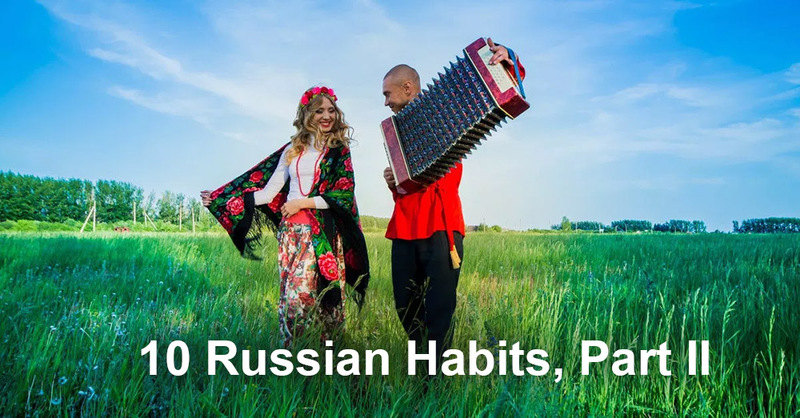 In the second part of the article we are going to discuss 10 weird Russian habits which cause foreigners’ misunderstanding. Russians use natural home remedies. Every adult Russian person is a health expert who does not need a doctor to accurately determine his/her diagnosis and prescribe a certain treatment. A Russian person knows himself/herself what medicine to take and in what quantities. Moreover, in order to avoid taking pills, Russian often use natural home remedies. A plastic bag may replace a bag for a Russian person. A Russian person always has a plastic bag in his/her bag in case there is not enough place in the bag. A foreigner will choose a bag, or a backpack of a larger size so not to carry things. Sometimes, a paper or plastic bag from a brand store can easily replace a usual bag for a Russian woman. One of the most common Russian habits is to tell anecdotes interrupting the conversation with a phrase, “And, you know, this reminds me of an anecdote…” or “Do you remember an anecdote?”, and then proceed to tell it, even if it’s completely irrelevant. Besides that, Russians like to cite old films of books. Even the laziest Russian will definitely say a toast before having a drink. When you are at a table with Russians, be prepared to listen to stories, tales, fables, and anecdotes, which usually take a lot of time. To change shoes when you visit people. Many Russian families have slippers specially prepared for guests, so when you come to visit them, they will immediately offer you to change your shoes. This habit is really shocking for foreigners, as in Western European countries, when you visit people at their place, you never take your shoes off, or change into slippers. You wear slippers only at home. Russians like to cook vinegret, herring in “shuba-coat”, or holodets (jellied meat). These traditional Russian dishes very often shock foreigners. In their opinion, this combination of products is totally impossible. However, as soon as they taste these dishes, they like them. Russians like going to the forest. Majority of Russians are ready to spend hours or even days walking in the forest picking mushrooms, wild berries, or herbs. Although they can easily get these from a shop, or at the market, or at a pharmacy, Russians prefer to do it by themselves, as they never look for easy ways. Russians like get-togethers in their kitchens. When you visit Russian people at their homes, you will be first invited into their kitchen but not in the living room, except for really special occasions. Russians are used to discussing the news and all other issues with their family at the kitchen. Therefore, in the Soviet time, the term “kitchen get-together” was coined. However, people from other foreign states prefer to receive their guests in the living room, or at a cafe. Russians very often re-watch Soviet cartoons. Russian people’s love and increased interest in the old cartoons can be explained by the fact that, unlike American and European cartoons, Soviet cartoons were intended for both children and adults. They were also distinguished with a high skill of their drawing and staging. “Nu, Pogodi!” (the Russian version of Tom and Jerry), “Bremenskiye Muzykanty” (The Musicians from Bremen), and “Snezhnaya Koroleva” (The Snow Queen), are among Russia’s favorites. “Kissing across the doorway is a bad omen”. A very common habit and tradition of Russian people – to give “a farewell kiss”. In order to do it both people should stay on the same side of a doorway, as kissing across the doorway is a bad omen. This is the end of the second part of the article about Russian habits. Russian habits reflect Russian traditions.